Traditional cavalry was still the norm in the 1920s in the US Army. Tanks were used by the US army, but only kept as a wartime necessity and confined to infantry support. By law, like in most Western countries, the cavalry was forbidden from having tanks. This did not prevent it from testing the motorized cavalry concept. In 1931, the US Army Ordnance ordered two prototypes from James Cunningham, Son and Company of Rochester, New York. The vehicles were delivered in 1931, tested until 1934 as the T4. Ten were produced afterward and standardized as the M1 Armored Car at Rock Island Arsenal (chassis numbers W-60114 to W-60125). Cunningham was a famous car maker and former coach builder, in business since 1908, known for having developed the first American V8 engine, back in 1916. This 4×6 armored car was relatively “standard” in general configuration, with the massive Cunningham V8 liquid-cooled engine at the front, occupying roughly a half of the length of the vehicle, protected by vertical armored shutters. The hull was angular, made of flat welded steel plates (9.5 mm/0.37 in at the thickest), assembled by bolting and welding. The driver and fighting compartments were at the rear. Forward and side vision was provided by armored shutters with sight slits. Access was granted through side doors. The one-man turret was conical in shape, with a single .50 cal (12.7 mm) Browning M1921 heavy machine gun supplied with 2000 rounds, and fore and aft firing ports for an additional 0.3 in (7.62 mm) Browning M1920 with 3750 rounds. In addition, the turret had fittings for two more machine-guns, to be used for AA defense. Steering was done with the front axle only. The transmission gearbox comprised four forward and one reverse speed. The vehicle was tested off-road, but performed only reasonably well on flat and solid surfaces. It had two spare wheels, able to rotate freely on stub axles, which could provide some extra contact in some cases. Its turning radius was 56ft 3in (or 17 m) to the left and 48ft 4in (or 14.7 m) to the right. Equipment comprised headlamps on the front mudguards, storage boxes over the rear twin axles, and a 6 volt battery. There was no radio. The vehicle had a ground clearance of 7.85 in (199 mm), wheelbase of 141 in (3581 mm), wheel tread of 59.75 in (1518 mm), and was found capable of fording 21 in (533 mm) water depth and climb a maximum slope of 23 degrees. These vehicles served, for all their career, with the 1st US Cavalry Division at Fort Riley, Kansas. There is no certitude about their ultimate fate, whether they were deactivated in 1939 or kept for training during the war. In either case, they never left US soil. 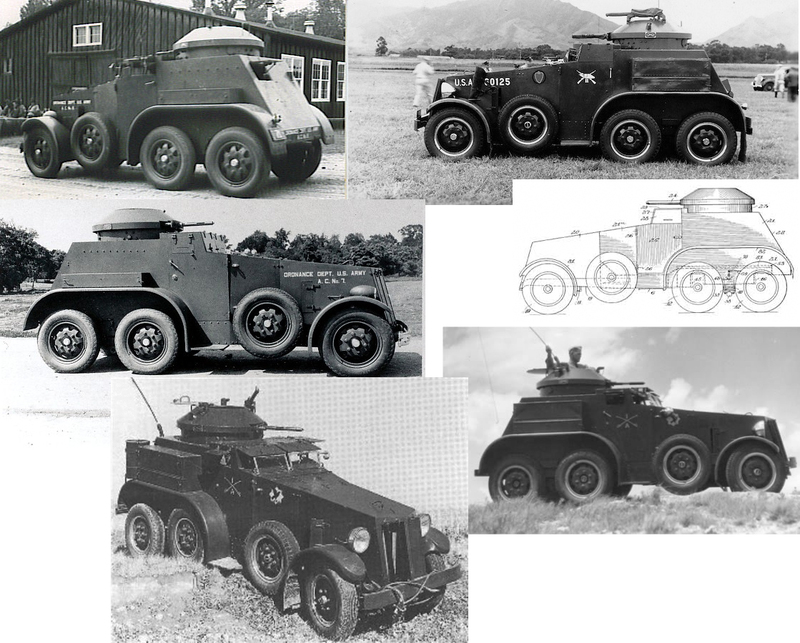 However, through numerous reports, they provided precious indications, that were taken into account when designing the next generation of US armored cars during the war, like the T17 Staghound and M8 Greyhound. T4 Armored Car on trials in 1931-34, at Fort Riley, Kansas. M1 Armored Car in training at Fort Riley, Kansas, 1930s. Notice the fully chromium-plated headlights. I think I has a digital copy of these in convey in Ky possibly heading to Kansas. I’d like to share it with you and get your opinion.